Once the favoured route option decision clears the statutory call-in period, it will be recommended to Highways England and the Department for Transport for inclusion in the Road Investment Strategy 2, which is the next funding period for the strategic road network. Option D’s alignment, if progressed by Highways England, would run from Galleys Corner at Braintree to a junction with the A12 to the south of Kelvedon. All work undertaken by Essex County Council is advisory at this stage, and a Preferred Route Announcement (PRA) can only be made by Highways England in association with the Department for Transport. 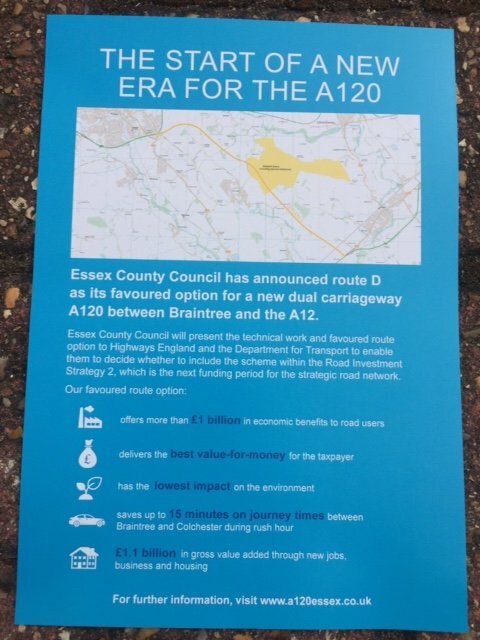 The aim is to get the A120 Braintree to A12 upgrade into the Government’s Road Investment Strategy 2 (RIS 2), the next funding period for the Strategic Road Network.